This is a standard Sudoku puzzle. 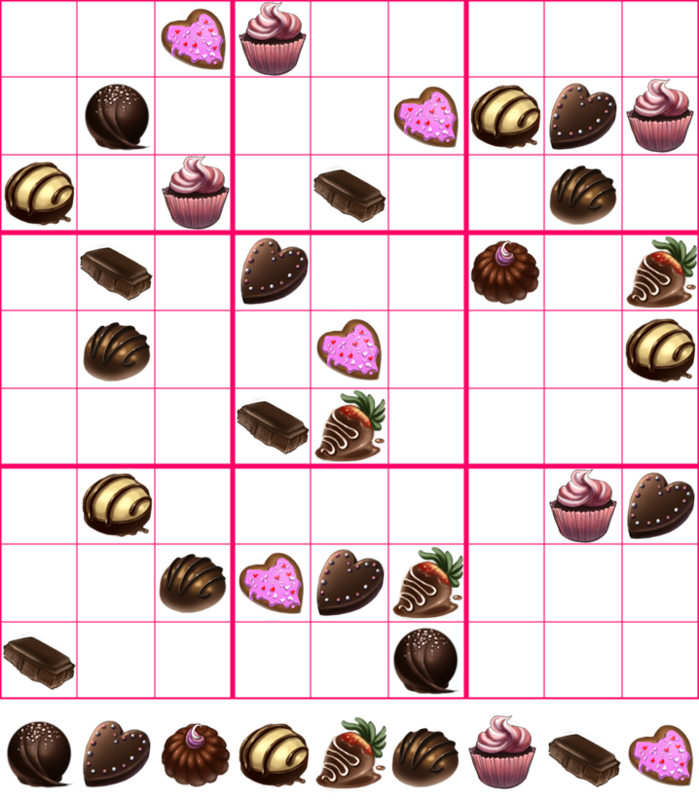 In order to solve the Sudoku puzzle, you must use all 9 candies in each square, row, and column. In any square, row, or column, you cannot use any candy more than once. If you are unfamiliar with solving Sudoku puzzles, I'd suggest searching the internet on how to solve them before attempting this puzzle. Please do not say that this puzzle is impossible to solve. It may be difficult, but it is possible and it does have a proper answer. 1. You must complete the Sudoku by yourself. No exceptions. 2. DO NOT post or share your Sudoku or any answers anywhere on Sylestia!!! You will automatically be disqualified from all Forum Games if you do this and you will make me very unhappy! 3. You must submit your completed Sudoku using the candies. You cannot replace them with numbers. Failing to use the candies will disqualify your entry. 4. After completion, you must upload your Sudoku to an image uploading site, such as http://imgur.com. If you choose to print out the Sudoku, then you will need a way to scan the completed Sudoku back onto your computer and then upload it to an image uploading site. 5. After you have uploaded your completed Sudoku, send a PM to OfficialGames with your completed Sudoku image and title the PM "Week of Love Sudoku". 6. Please DO NOT PM me your Sudoku!!! I will ignore it and your entry will NOT be counted. Additionally, please also do not PM me asking me to check your Sudoku to see if you've gotten it correct or if it's been sent. The onus is on you to follow the rules and submit your entry correctly. Feel free to ask any questions regarding the rules directly here in this thread. There will be 3 prizes awarded. There will be 1st, 2nd, and 3rd place prizes. Everyone who submitted a correctly solved entry will be placed into a random drawing where the top three names will be the winners. There will also be a Participation prize for everyone who submitted a correctly solved answer. Please wait to receive your PM to claim your prize. Thank you and congrats! Edited By Krinadon on 2/23/2018 at 3:55 AM. Edited By Streamstar on 2/9/2018 at 8:55 PM. We can't replace them with numbers, but can we do quick-draws of the candies? If they're recognizable? Because I have no easy way to cut and paste images repeatedly. If you are using a computer, I suggest using Paint 3-D. I'm not using a computer, thats why.